This year in Baltimore, we have a couple of new options to assist in that regard. While the Tuesday Night Reception has always been a fun party, there was a cost associated with it and only a small percentage of attendees actually participated in the event. This year, we are proud to offer a Networking Reception completely complimentary to all conference attendees. 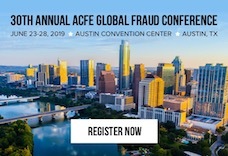 This reception, with optional donations benefiting the ACFE Foundation, will take place within the convention center immediately following the last breakout sessions. Free and convenient makes it difficult to say no so we are hoping for a great turnout. The other social option is new for us this year. We have secured a large block of tickets for the Tuesday night Baltimore Orioles game. The game is at 7:05 p.m. and they will be playing the Philadelphia Phillies at Camden Yards, which is a beautiful field and just a short walk from the Baltimore Convention Center. Because of our big group, the tickets have been heavily discounted and are only $10 each. To ensure that you are sitting with your ACFE colleagues, they must be purchased directly at orioles.com/tix/acfe. Even if baseball is not your thing, it should be a fun night at the ballpark meeting new people and building the type of professional and personal relationships that last a lifetime. I hope to see you there.